The Star Wars Battlefront Squad Shield power up will let you deploy an energy shield that will protect you and your teammates from various enemy weapons. This is a great defensive power up that will help you when you find yourself in need of added protection, or to protect your advancement. While most weapons will not be able to penetrate the shield when firing upon, or from within, there are certain weapons that will be able to. The Cycler Rifle is one of the weapons that can penetrate this shield and the Personal Shield. 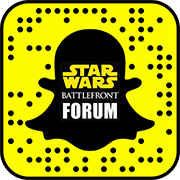 If you would like to discuss the Power Ups then visit our Battlefront Power Ups forum.